Dollikin with her suitcase, preparing to leave on a trip around the world. Phew! I've been sewing like a sweatshop employee lately! Besides finishing this extensive set I also had to help all the girls from church learn to sew skirts last night! That was a learning experience! Who knew they would think to start shooting each other with pieces of elastic? 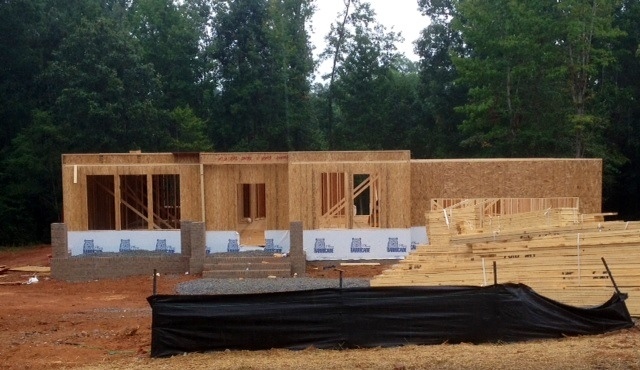 Well, anyway, here is my latest BIG project. I have so much time in this one I'll never get paid for it. 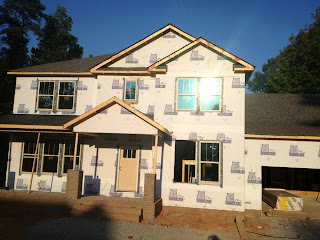 But that's okay because it was a true labor of love! When I was growing up, one of my favorite books was Tasha Tudor's A is For Annabelle. 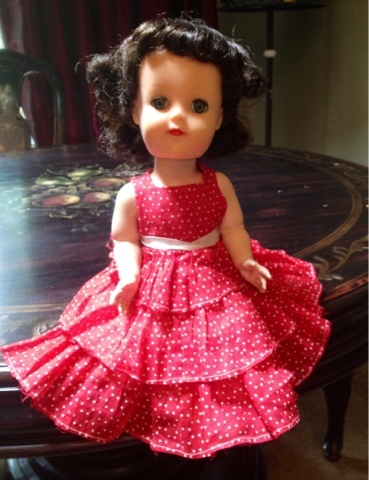 Annabelle was a doll: "Grandmother's Doll" is how she is described. I guess today we'd describe her as a French fashion doll. She was a grown up lady doll who lived in a chest with all her many clothes. She had some piece of clothing or an accessory for every letter of the alphabet. Grandmother's parents were evidently extremely rich! 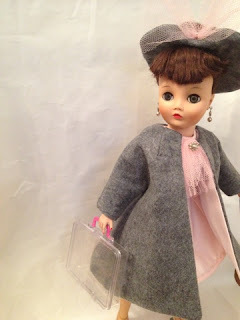 Annabelle had an umbrella, opera glasses, gloves, furs, hats, boots, coats...the beautiful illustrations showed little girls dressing her and playing with her. I could have died from jealousy! I wanted a doll like Annabelle in the worst way. My mother and grandmother bought me an old-fashioned china head lady doll to try to give me one like Annabelle, but she didn't have any extra clothes, so she was unsatisfactory. I have often thought if they could have found a Revlon or Dollikin for me it would have fit the bill perfectly. 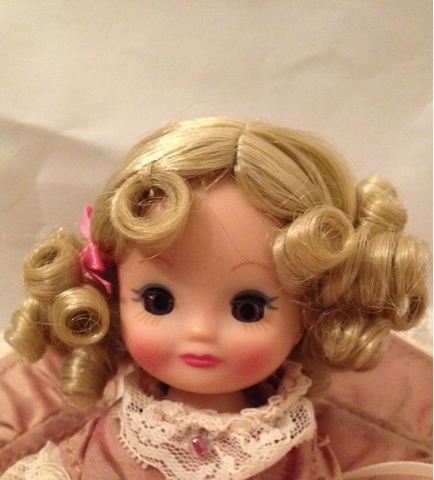 My mom was a girl when the Revlon and Cissy dolls first came out, but she didn't like them. She liked child dolls because she liked pretending she was their mother. Her family also would not have had enough money to buy all the accessories that make those dolls so much fun. I have found, however, through my work with these dolls that it's a lot more fun to look around and really SEE things in a different light so that you find uses for everyday things that can act as accessories. In this case, a thrift store grab bag yielded the tiny clear glitter plastic pencil case. 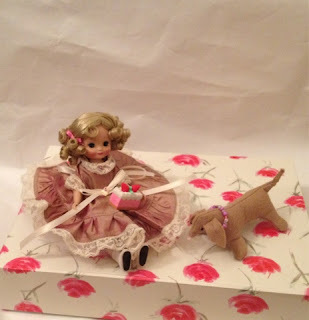 I thought it would make a great doll's suitcase, and the idea for the world tour was born! I've had this Dollikin for a long time. I always planned to sell her, but I've had some trouble letting go! She's a really nice doll. She has none of the loose stringing you usually find and which is so hard to repair. Her hair is really nice and it's cut in an unusual style. When I got her she had lots of little splits and cracks that needed repair. 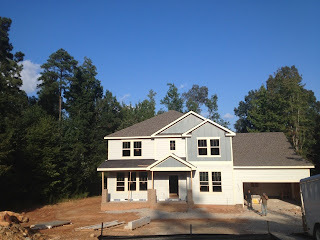 I fixed all these with Kwik Plastik and repainted the repairs with oil paint. 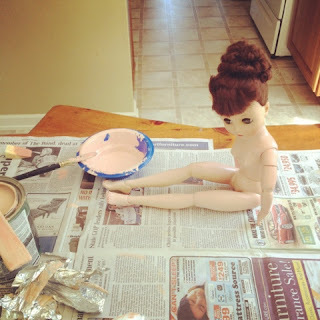 Dollikin gets a repaint after her body repairs. 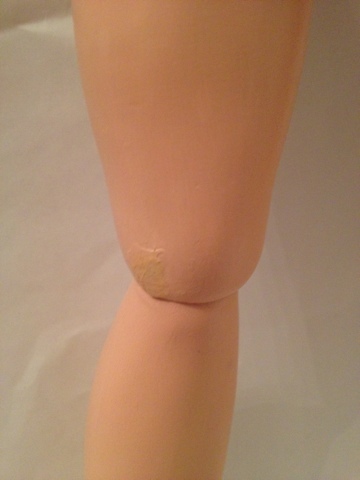 I fixed her knees, which get those really common splits, her hand and foot. She had existing repairs to the front and back of one knee. Since these were very stable I just painted them to make them less visible. 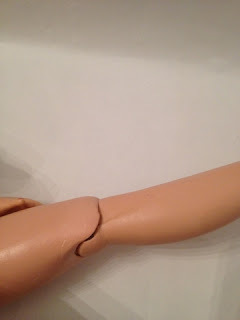 The only cracks I left undone are under her hand in the wrist joint. 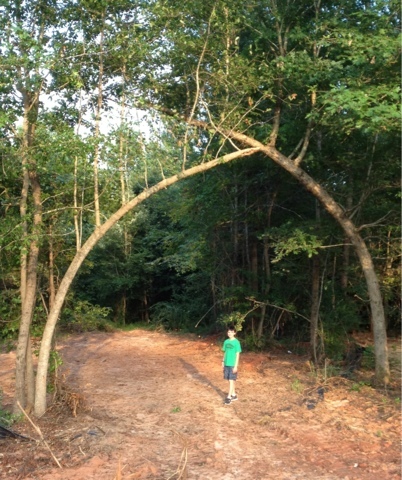 These are not visible unless you over-extend the joint and they are not necessary to repair for stability, so I left them. 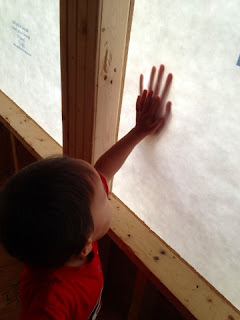 I worried that trying to rebuild them would cause the joint to be unable to move smoothly. I left this crack unrepaired because it isn't usually visible. After all her repairs Dollikin can stand alone and hold poses. She is very sturdy and should be ready for many more years of play. This is one of the nicest dolls in my "collection" right now. 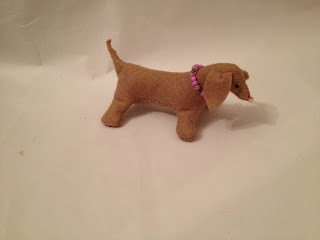 Of course, since most of my dolls are for sale my collection is always evolving! The doll after repairs and repainting. This doll captured my imagination immediately. I think she really recalled Annabelle to me. In actuality, she's much more poseable and unique. Annabelle would have had a kid body and china limbs and head, so she would have just had to sit around. Dollikin can move so many ways and is so realistic you could really use her as an artist's mannequin if you wanted to! She even has a little sculpted almost six-pack on her stomach! If my daughter had shown even a third of my interest in this doll I could have used her as an excuse to keep Dollikin, but my daughter has so many dolls she doesn't think this one is anything special! She's really begging for the poodle! Ahh, Paris in the springtime! Dollikin strolls the boulevards with Francoise, her French poodle. She stops at a Patisserie to sample the tarte aux fraises, made with just-picked local strawberries. Her sweet pink dress, sewn from buttery, thick bridal satin, is the perfect choice. The hem is embellished with silver and clear glass beads, and she wears her "pearl" brooch at the neck. 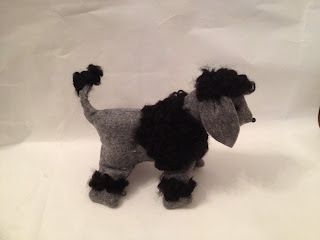 Her wool felt cartwheel hat has a cutout in the center to accommodate her hair. Her 1950s shoes in pink and aqua with rhinestone trim are the ideal finishing touch. It's still a little blustery, so Dollikin dons her wool trapeze coat with pink bridal satin lining. 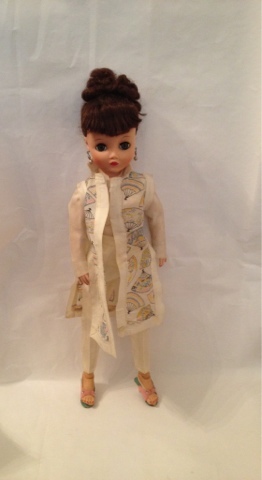 The coat can be folded out at the darts so the lining shows if Dollikin wishes. Francoise, Dollikin's faithful friend, loves the excitement of Paris. She belongs to the fashionable capital. 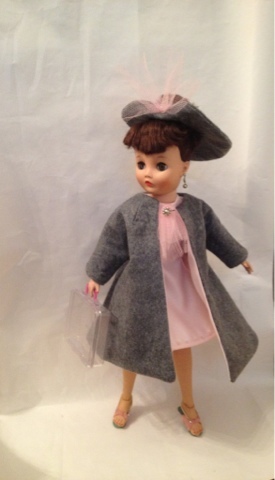 Francoise's wool felt body matches Dollikin's coat. 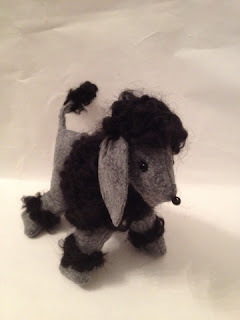 Her black curls are hand-applied wool and acrylic yarn and her eyes and nose are Czech glass beads. After a few weeks, Dollikin begins to find Paris a bit dull. She books a First Class cabin on the train to sunny Spain. The Spaniards can't believe how quickly she picks up the local dances. She's a natural in her red and black mermaid skirt gown, with black lace shawl, beaded hair ornament, and rhinestone choker. The hair ornament is really a big old 80s earring! 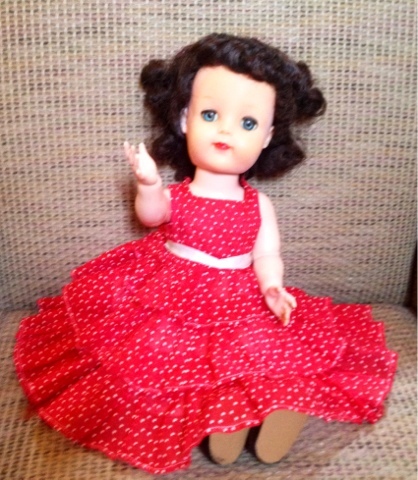 Her 1950s red elastic pumps match her dress perfectly. These needed a little repair, just re-gluing of the felt and stuff like that. Since Dollikin doesn't ever settle down for long, before you know it she's on the jet to Asia. She wants to visit China and Japan. As always, she adapts to the local habits. She picks up some gorgeous silk undergarments, lace and bead trimmed tap pants and a bra. She's so pampered in her silk and sheer nylons! Dollikin finds the Asian persuasion to lounge in silk so compelling, she also buys an original Uneeda Lotus Blossom 3-piece ensemble. 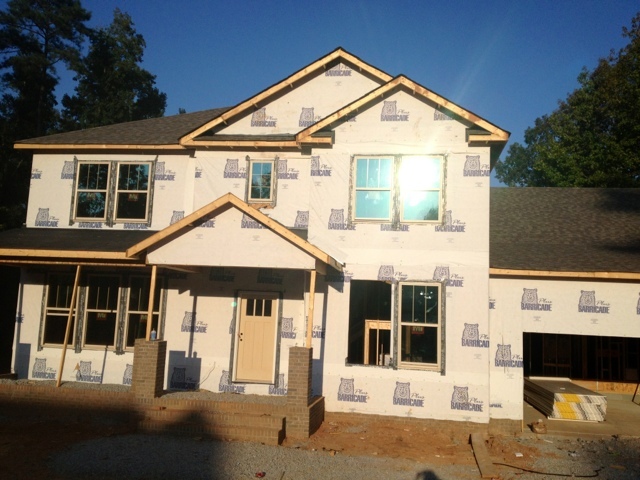 Nothing is as comfortable for entertaining at home! I would like to insert here that I have actually traveled quite a bit in China and all the people I see are always working like dogs, not lounging around in silk, but I'm going with the 1950s American perception for this story! It's a nice idea, anyway! The Lotus Blossom suit was in deplorable condition when I got it. I have made extensive repairs, but it still very fragile and shows its age. Finally, Dollikin decides to head home with all her exotic fashions. 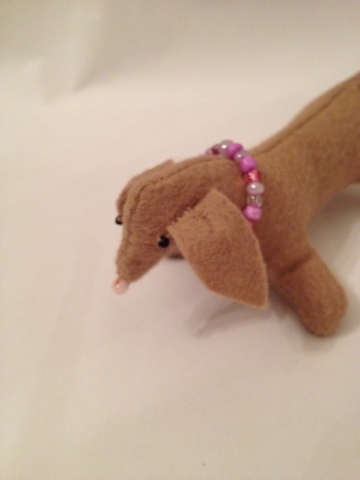 It's too hot in China for poor Francoise, and Dollikin wants to show her new wardrobe off to her friends! 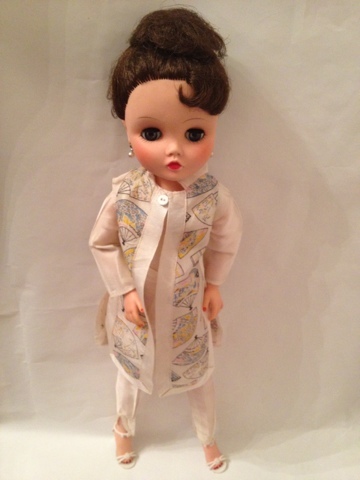 I'll tell you what: not only is this my dream doll, but she's wearing my dream wardrobe as well! 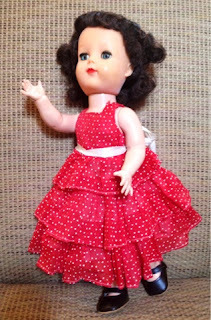 If only I had Dollikin's figure and were only 18 inches tall so I could make all my clothes from scraps! 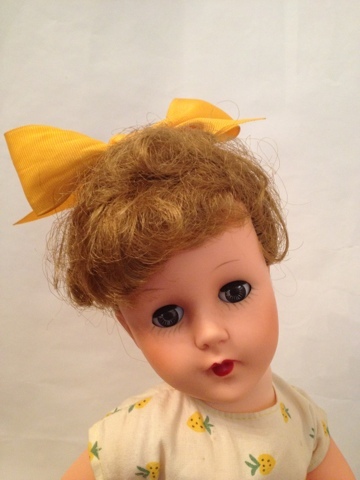 I would have absolutely loved this doll when I was a girl. I'm still having trouble selling her now! 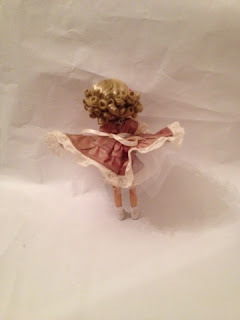 A couple weeks ago I covered the re-stringing and repair of my mother's childhood doll, Janie. Janie is actually Posie by Ideal. Posie was evidently the predecessor to Saucy Walker, and she looks much the same except that she has a closed mouth. 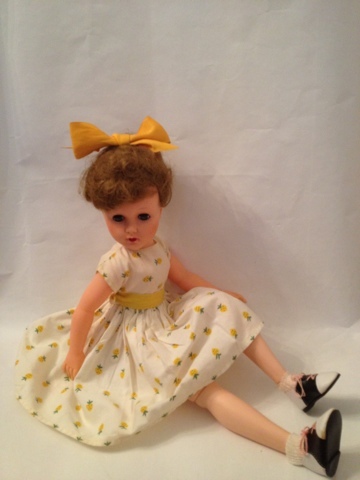 Posie was billed as the "Doll of a Hundred Lifelike Poses", which is a pretty big overstatement as far as I can see! 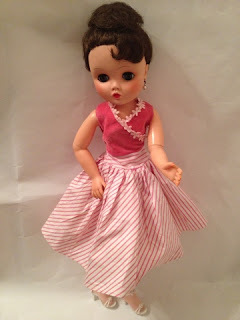 Just like Ideal's Betsy McCall that I covered earlier, Posie's arms are strung so that if they are tight enough when you move one the other one will snap up or down as well. Her knees bend, and I read somewhere that she was originally a "praying" doll, but you can't make her hands meet or anything. Basically you can move her arms and legs up and down, turn her head, and bend her knees. Posie was supposed to be a walker, but Janie isn't anymore. 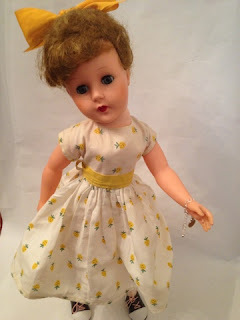 Janie had a lot of use, though, first as my mom's play doll and then as mine. Posie had a cryer, and Janie's does still work. Janie had some repairs needed. Her face got white spots on it when my mom was still little. Over time these turned brown so that they look like freckles. I bleached these some with benzoyl peroxide. I restrung her loose arms and fixed the splits in her sides. 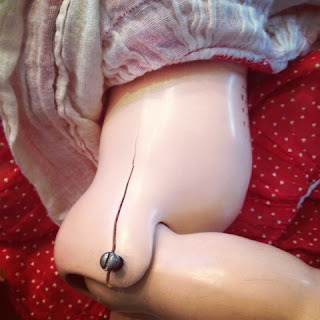 After her body was repaired, Janie just needed some cosmetic work. I washed and softened her hair with fabric softener and reset it on perm rods. You "perm" the old Saran hair by rolling it and pouring very hot, almost boiling, water over it. Let it dry completely, at least 24 hours, and unroll. I looked at lots of mint Posies on eBay and Doll Reference to get the style right. I think her hair turned out really well. It looks just like the original! I found some tiny heart-shaped barrettes and pulled up the sides with those. The dress was made in the 50s by my grandmother. I cleaned and pressed it with starch. It has a built-in buckram or linen slip to help the skirt stand out. This has gotten soft over time, but the skirt is still nice and full. My grandmother actually sewed this dress on a treadle sewing machine! 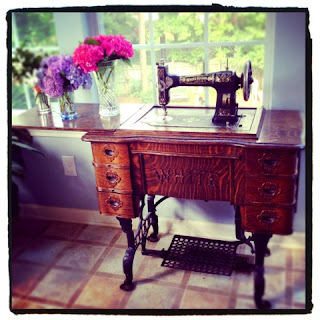 My grandfather put a motor on it so it went really fast, but it couldn't backstitch to tie knots, so my mother had to sit next to the machine and tie the knots when Grandma would sew. 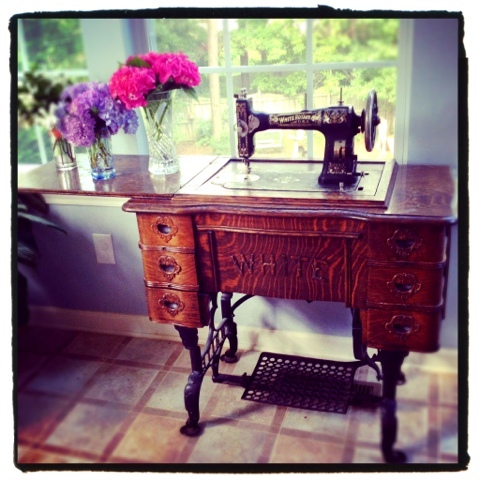 This is the machine on which my grandmother sewed the dress. 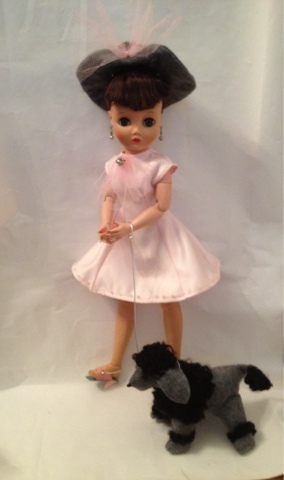 I gave Janie some New Old Stock black doll shoes. She still needs socks, but I don't have any of the rayon ones, which were the type she would have had. Janie's a really pretty doll again now that she's all restored. She can pose well and her coloring, with her bright blue, almost turquoise, eyes and black hair is really beautiful. My husband, who has Scottish ancestry, has this same wonderful coloring. 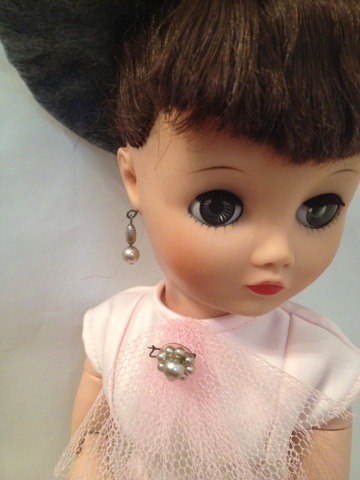 I have come to believe from looking at eBay listings that the brunette Posie is much more rare. You see the blond one all the time, but hardly ever the raven hair. Saucy Walker seems to mostly have come in brunette, but later on. So if we were ever to sell Janie she might be worth a lot, but of course we'd never do that! 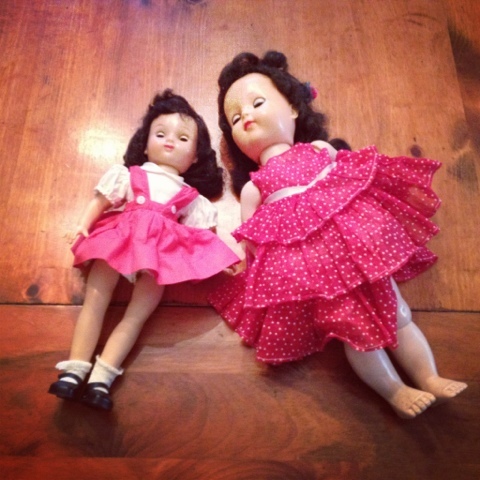 Two fifties dolls needing restoration. Well, as always happens, just when I think I know pretty much all there is to know about a certain subject, something comes along to turn me on my head! I had pretty much decided I knew most of the teen fashion dolls. I recognize them by their face molds with pretty good accuracy. So, when I ordered this teen fashion doll lot from the fifties I thought I knew what I was getting. 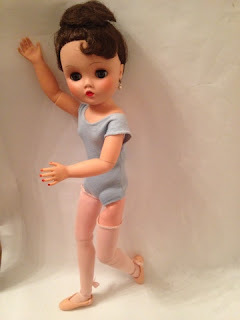 I saw a Valentine ballerina and a Uneeda Dollikin face straight leg fashion doll. When the dolls arrived, though, I saw I was mistaken. First of all, the doll I thought was a Uneeda fashion doll was jointed like a Dollikin but without joints in the wrist and upper arm. 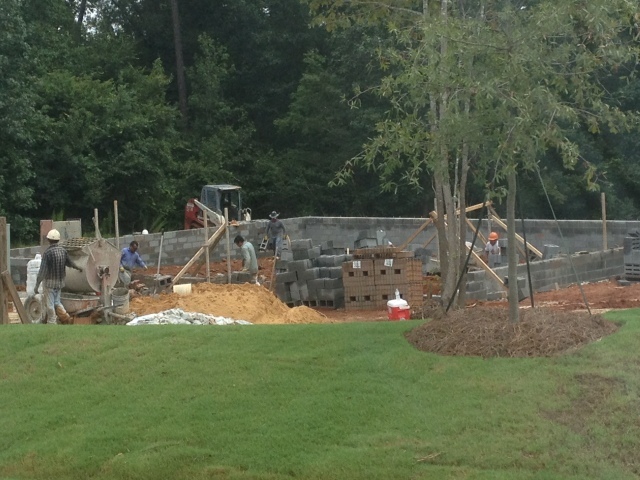 I could hardly believe my eyes. This is clearly not a Dollikin, but it is also not Twixie, a different Dollikin copy, because she is not marked as Twixie was. I began to wonder if this could be the ultra-rare Valentine Manikin, sometimes called Mannikin. I could see this doll is in almost perfect condition. She needed re-stringing. I was able to re-string her arms and legs, but she is so well made that her central string, from her head to waist, is encased in a wooden tube, so until the elastic breaks there is no way to get to it to cut it. That is why her waist is still rather loose. She can pose, though, and can be displayed propped up or with a stand. The only issue I saw besides her stringing, was two very small splits starting on either side of one ankle. 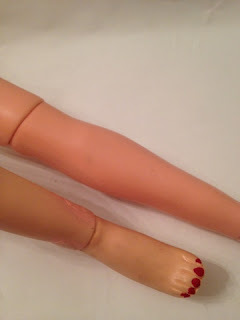 These were so minor you could barely notice them, but since my goal is always to get these dolls back to playable condition I went ahead and fixed the splits with epoxy (as I describe in my Cissy post) and repainted them. 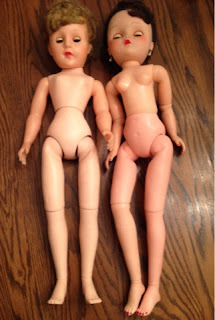 These dolls came with an extensive wardrobe. 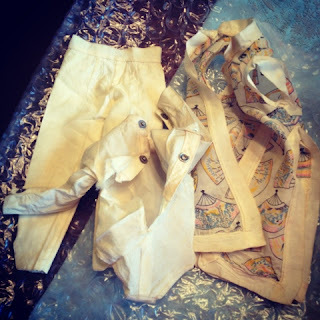 I think maybe the clothes belonged to the doll I thought was a ballerina. When I started restringing her I found that her ankle joints would not bend. I messed with them and treated them with WD-40, but I finally felt they would break if I tried to force them and I began to wonder if they were not meant to move after all. 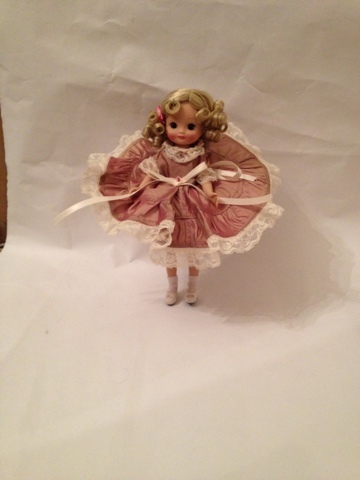 This doll is the Valentine ballerina mold, but her ankle joints do not move. She also has an internal walker mechanism, but there is no rod connecting to her head. So her legs walk but her head doesn't turn. 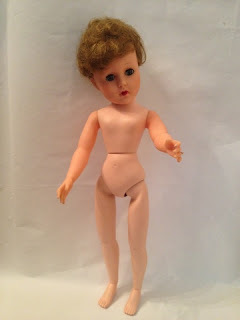 Valentine allowed Sears to use this mold for their Happi Time dolls, and some of those were fashion dolls with flat feet and big wardrobes, so this is possibly one of their dolls. She could also be one of Valentine's mechanical ballerinas, who originally had feet which attached to a rotating stand, allowing the doll to dance. If so then obviously she is no longer working. Since she's such a lovely doll I decided to do a restoration. 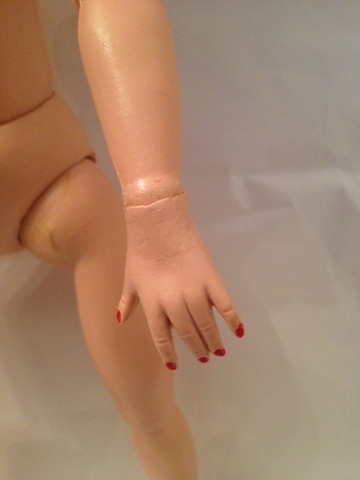 This doll needed one finger and her lips repainted, so I did that. Her hair is also still in its original set, a short curly ponytail like a bun. I decided to style her as a teenage "Bobby Sockser" all ready to attend the sock hop. 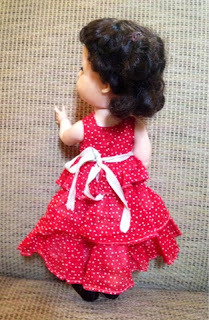 I gave her a commercial vintage dress, rayon socks, and saddle shoes and tied her hair in a big bow. One sock is too small to fold over, but the other one can fold. 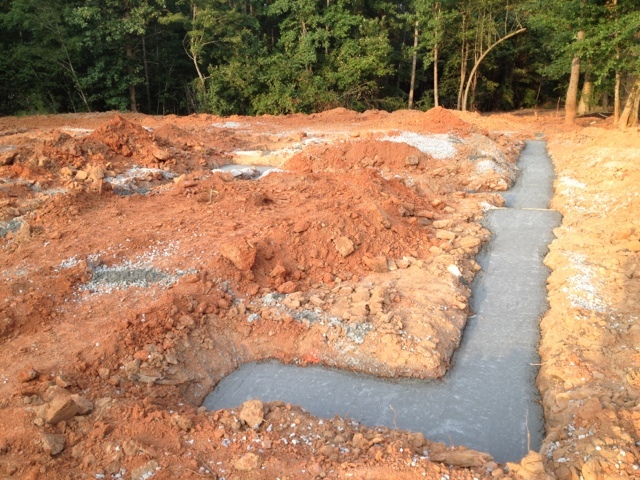 This isn't really noticeable if you aren't trying to restore every tiny detail! 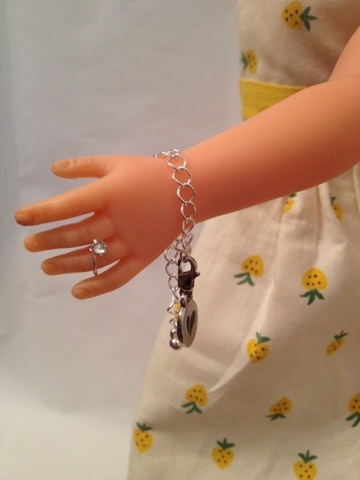 Of course, she had to have that popular fad: the charm bracelet! 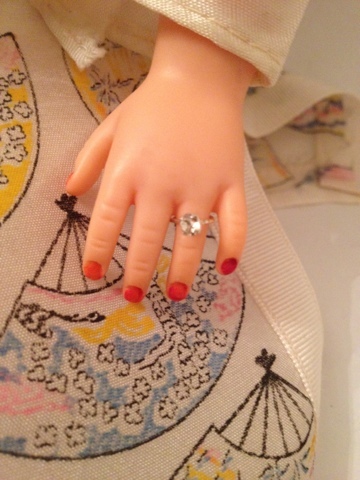 I gave her a faux diamond ring, so all her girl friends will wonder if she's engaged and be so jealous! As always, I had too much fun! I decided to give the large wardrobe to the Manikin doll. Clearly, she's a talented professional ballerina with an exciting life. Each day she works out in her ballet practice clothing and her real, signed, Capezio ballet shoes. She changes into her pink candy stripe day dress and high heels after rehearsal. While entertaining her many friends she wears an exotic, Asian-inspired "silk" lounge suit, just like the Lotus Blossom Dollikin suit. 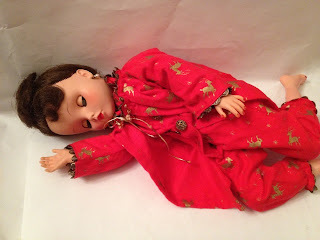 At night she snuggles up in her cozy red flannel pajamas and robe. This intricately-sewn Mommy-made set features very lovely and unusual vintage buttons and even sports tiny pockets. Of course, such a lovely and talented girl wouldn't remain single for long, so she wears a tiny adjustable engagement ring made by me.